Since iRedMail-0.7.0, quarantining related settings in Amavisd are configured by iRedMail but disabled by default, you can easily enable quarantining with this tutorial. With below steps, Virus/Spam/Banned emails will be quarantined into SQL database. You can then manage quarantined emails with iRedAdmin-Pro. Edit Amavisd config file, find below settings and update them. If it doesn't exist, please add them. on Red Hat Enterprise Linux, CentOS, Scientific Linux, it's /etc/amavisd/amavisd.conf or /etc/amavisd.conf. # Change values of below parameters to D_DISCARD. # Detected spams/virus/banned messages will not be delivered to user's mailbox. # Quarantine SPAM into SQL server. # Quarantine VIRUS into SQL server. # Quarantine BANNED message into SQL server. # Quarantine Bad Header message into SQL server. Restarting amavisd service is required. on Red Hat Enterprise Linux, CentOS, Scientific Linux, it's /var/www/iredadmin/settings.py. on Debian, Ubuntu, it's /opt/www/iredadmin/settings.py or /usr/share/apache2/iredadmin/settings.py. # Log basic info of inbound/outbound, no mail body stored. Restarting Apache web server or uwsgi service (if you're running Nginx as web server) is required. 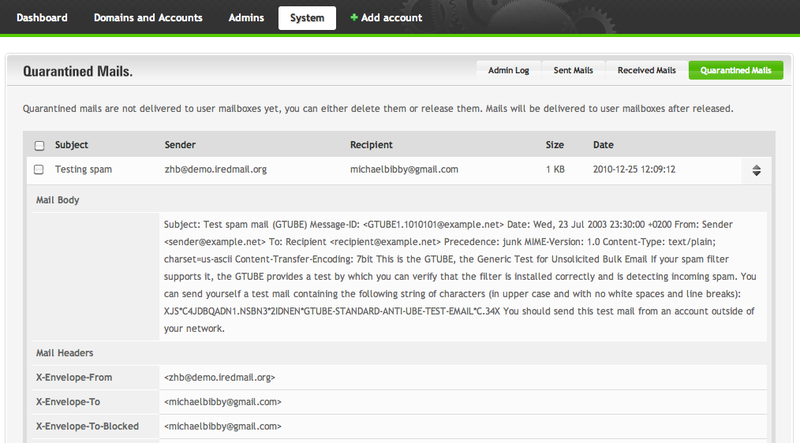 You can now login to iRedAdmin-Pro, and manage quarantined messages via menu System -> Quarantined Mails. Choose action in drop-down menu list to release or delete them. Screenshots attached at the bottom. iRedAdmin-Pro ships script tools/notify_quarantined_recipients.py to notify users which have email quarantined in SQL database. The notification email message is read from (HTML) template file tools/notify_quarantined_recipients.html, if you want to modify it, please copy it to tools/notify_quarantined_recipients.html.custom then modify it. During upgrading iRedAdmin-Pro, this custom file will be copied to new iRedAdmin-Pro directory, so you won't lose your customization. # SMTP server address, port, username, password used to send notification mail. # email, so that user can login to manage quarantined emails. #       mail user cannot login to iRedAdmin-Pro for self-service. Don't forget to use the correct path to notify_quarantined_recipients.py on your server. --force-all-time Notify users for their all quarantined emails instead of just new ones since last notification. Now all clean emails sent by your mail users will be quarantined into SQL database. Expand quarantined mail to view mail body and headers.